Relationships are valuable commodities. Sometimes we forget this. Shows like THE STORY OF MY LIFE produced by Mad Anthony Theatre Company last weekend in Hamilton’s Fitton Center for the Arts remind us of this fact in deeply touching ways. It’s the story of Thomas, a very successful writer, and his childhood best friend, “Alvin,” a whimsical George Bailey-type, and how their lives intersected before their friendship fell apart. This show does not have a happy ending, though I did feel satisfied when it concluded. The show couldn’t have been more perfectly cast. 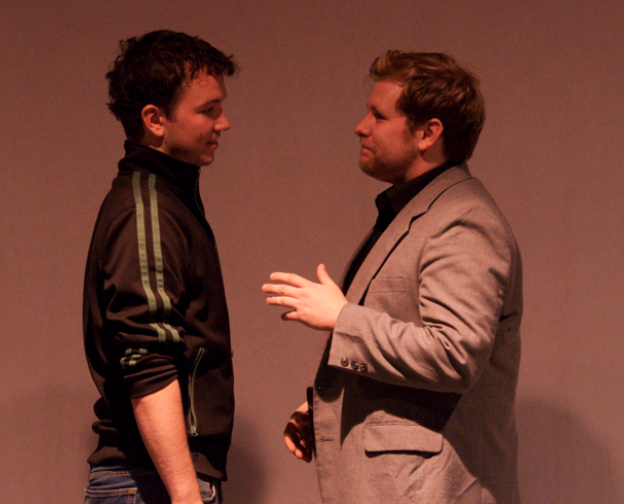 The interpersonally challenged “Thomas” is played with the required narcissism by Zack Steele, a recent graduate of Wright State University. Steele is a fine actor and he looked the part. While the score was often at the top of his range, his obvious training kept the vocals at a professional quality. The level of anger and frustration and remorse that he showed as the script climaxed was authentic and moving. Sean Jones (“Alvin”) is such a versatile artist. He often gravitates towards comedic and quirky characters; Alvin certainly is quirky. But Jones (and most likely with the deft directoral hand of Henry Cepluch) was restrained here, making the character feel wistful and fanciful yet grounded. I know people like Alvin; Jones made me want to be more like Alvin. These two young men are real life friends; the chemistry was palpable. I was drawn in immediately and they held my attention throughout the 90 minute, one act performance. And they moved me. I was choking back tears from the outset. I’m not entirely sure why. The musical score isn’t great; there’s nothing memorable about it and there is no hook, nothing catchy. But it worked for me, as it carried a consistent tone throughout and musical director Rebecca Childs supported her actors well on the piano. The script is a little abstract; it zips in and out of flashbacks to the present in somewhat jarring fashion. But yet these young actors seemed to understand the material. They showed maturity beyond their years as performers and I credit their theatre-families for some of it. Jones is the son of a theatre critic, Richard O. Jones; Steele the brother of Joshua Steele artistic director at The Carnegie. But I also credit their education. Wright State consistently turns out marvelous actors and these two are no exception. When Alvin, chastising his best friend for essentially “forgetting where he came from,” says “You can’t remember something if you weren’t there . . . ” I nearly fell apart. The line is a good one, Jones’ delivery and Steele’s reaction sold it completely. I was done. The set design by Mary Slocum was recognized by the League of Cincinnati Theatres and rightfully so. 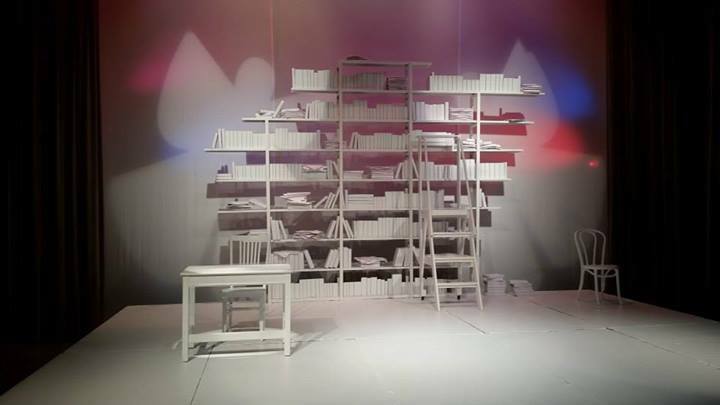 The stark white bookcase, filled with white paper and white book jackets, gave the space an ethereal and mystical feel matching the tones in the show. I really appreciate her work and think she’s an underrated talent. In fact, I would tell you that Mad Anthony Theatre Company is underrated and I look forward to seeing what they do in their newly renovated space next year. Their season will consist of three shows – a Nora Ephron play called “Love, Loss, and What I Wore,” a dark comedy called “Any Given Monday,” and a comedy about the making of “Gone With the Wind” called “Moonlight and Magnolias.” We’ll have more details later. This show is an interesting one for sure. I wish it had a better score and I wish it wasn’t quite so sad . . . but it did serve as a reminder to me that as a writer once in awhile I ought to “look up from the page.” I’m going to go call a friend. MAD ANTHONY THEATRE COMPANY performs in the Fitton Center for the Arts in Hamilton, Ohio and is chiefed by Henry Cepluch. More information about them can be found here.